Trade Names - ZT | Zippertubing Co. 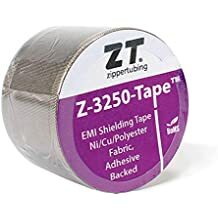 The Z-3250-Tape™ is a conductive tape consisting of Zippertubing's Z-3250-CN EMI shielding fabric laminated to an electrically conductive transfer adhesive backing. The adhesive eases installation and ensures continuity between individual coil winds. Use as a standalone shield in applications requiring a soft, thin, flexible and non-abrasive shield. 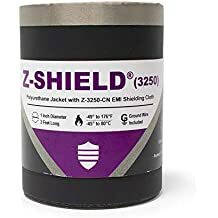 The tape allows joining of Z-Shield®, Shrink-N-Shield® and PRT (S)™ EMI Shielded jacket sections at cable splices, branch-outs and transitions to connector hardware. Z-3250-Tape™ provides excellent electromagnetic shielding when spirally wound with a 50% overlap (minimum). Z-3250-Tape™ standard tape width is 1.0 inch, while custom widths are available. This product has an operational temperature range of -45° to 150°C (-49° to 302°F) depending on shielding selected. Heat-Wrap® is designed for moderate-to-high-temperature, low-cost heat-barrier applications. Heat-Wrap® uses a high-performance Acrylic adhesive-closure system that provides excellent bond strength when combined with our available jacketing materials. The adhesive closure yields a product that is easy to install, requires no tooling, and has a low installation cost. The adhesive has very good fluid resistance and will not degrade with exposure to ultraviolet light. This material is ideal for adding low-cost thermal protection to your wires and cables.